It was June 12, 2016 - Sunday morning. The sun was already out, scorching bright at 7:30 a.m. 17 wowbies boarded the bus, all set to trek up Siddarabetta. As the journey started, we had a round of introduction. Glad we had few Yoga and Karate champs!! Raksha (our organizer and my savior - I will tell you why later :P ) suggested an ice-breaker game related to food names. This game increased our craving for breakfast more. We had all the names, starting from sugar, salt and beer to Soan papdi, Navratan Kurma, schezwan varieties, tarts, pulusu and kozhambu varieties, and what not!! - everyone just dug into their brains to pull out a food name, the two teams fighting over each other, in case the opponent team came up with its own recipe with all due creativity. We stopped by at a highway side hotel, to have our breakfast and the splendid coffee gave us a dose of enthusiasm. We reached the destination sooner, just after our hunger went dead. We reached the spot, and geared up to ascend. 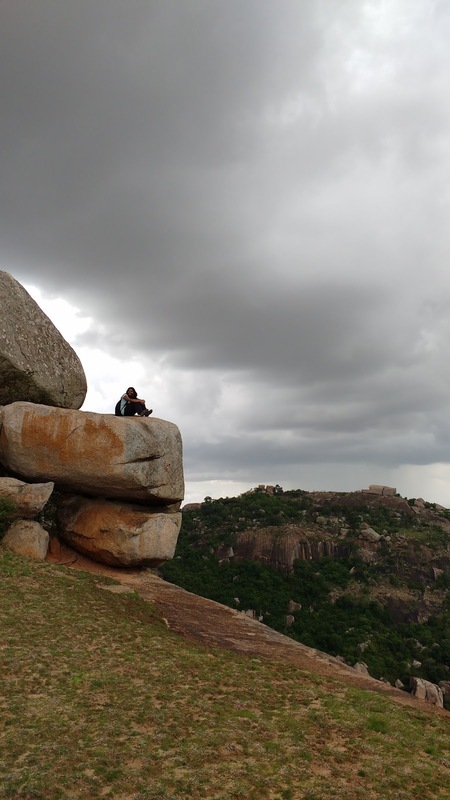 Siddarabetta, meaning “abode of saints”, has mythological significance and is believed that for several hundreds of years, this hillock was the abode of great seers and thus the name. 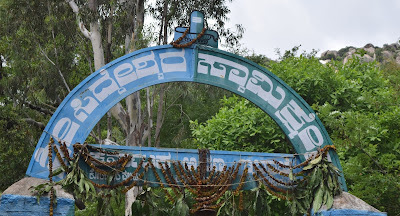 There is water spring atop the hill, which is believed to be very pure and heal the body pain if any, of having been trekked up ( the stories that I have heard off). The steps are built to some distance, but wide, little steeper and greater in height. Our legs started aching on climbing a few steps. Just after the steps ended, the surface became rocky and steep - one has to mind their steps very carefully. Although the steps are carved on the rocky surface, its still not an easy task. Occasionally, we would encounter a local vendor, who would ask us buy some eatables from them, we just cracked a lighter joke and moved on. There were many monkeys around, unafraid and undeterred on showing sticks or shooing them away, who would show up their canny teeth and make us scared in return. This was when Raksha was screaming loud to everyone to have sticks, and indeed brought one for me. With all these buzzing of monkeys around, finally reached the top, where a temple is situated inside the caves. The breeze was soothing anyways. We waited until everyone was up there, and then decided to go inside the temple in groups (somebody had to be there to guard our bags and shoes from the monkeys!! ). The temple was inside a cave, felt very cooler. A couple of us took the shower from the spring water. It was chilling cold yet soothing the body. We went a little further, and came across few more peaks and caves-like. The view from there was breath-taking, I had never thought our next-sibling district Tumkur has such a beauty in it. We could see the clouds passing, and the showers moving along with it. I had prayed to Sun-god, to spare us some mercy (jeez..I had turned a few shades darker with my previous trek ) and he did heed to it luckily, oops!! but the rains din’t. 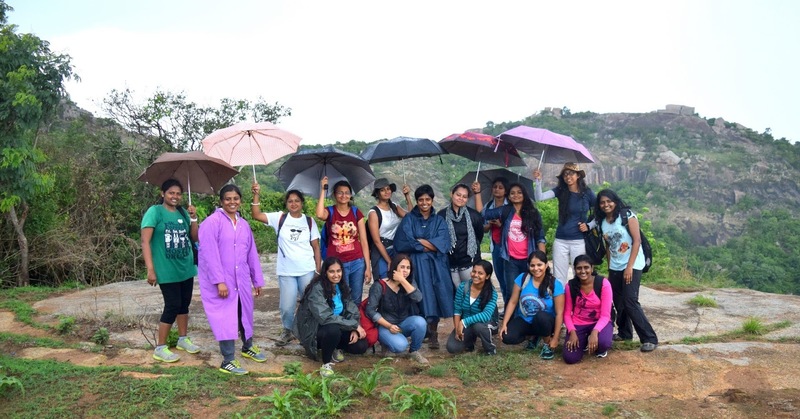 Just when we were about to take a group snap and wrap up, the rains mercilessly lashed out showers. Most of us got drenched completely, except the ones who had ponchos. And now the real adventure started. 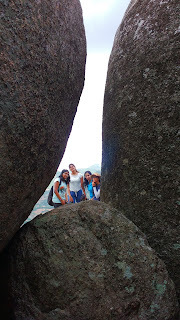 The caves and the rocky surface which made us thrilled while climbing, made us skip a heart-beat while coming back. It had become more slippery and our shoes would slid, just like on ice. It just took our trek experience to a next level. While few decided to go bare-footed, few others resorted to sliding down. Helping each other cross paths on the narrow edges, hugging the rocks and descending gave much more thrill. One had to really be present there, to get it what it was. On reaching the ground, everyone was very hungry and pulled out snacks to curb it a little. 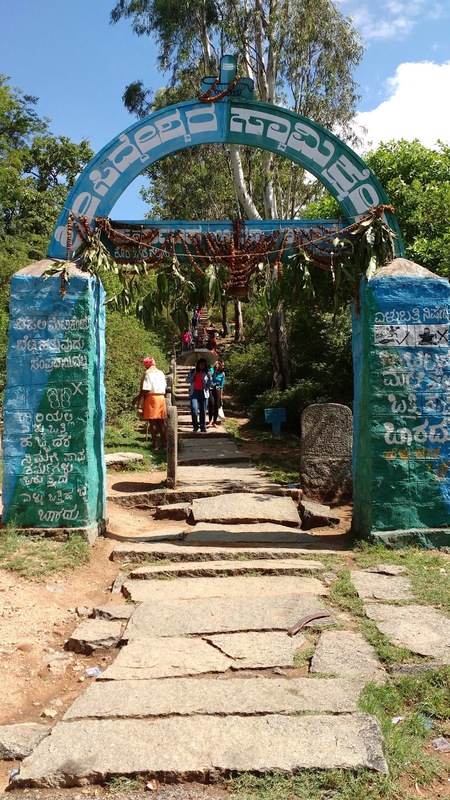 We had our lunch at the “Anna Dasoham” offered by the temple and headed towards Goravanahalli Lakshmi temple. By this time, all the ladies had jelled up through thick-and-thin. We headed towards Bangalore after seeking the blessings at Lord Lakshmi temple. The route back was a bumpy ride for some stretch until we encountered the highway. We had a feedback session in the bus enroute to Bangalore. Everyone had a huge smile on their face, of having done a most amazing treks. This trek gave each one of us a chance to learn few things, meet up some amazing wowbies and the mommies who are truly an inspiration. The final adieu had so much heartfelt warmthness and hoping to meet these set of enthusiastic souls again in future. 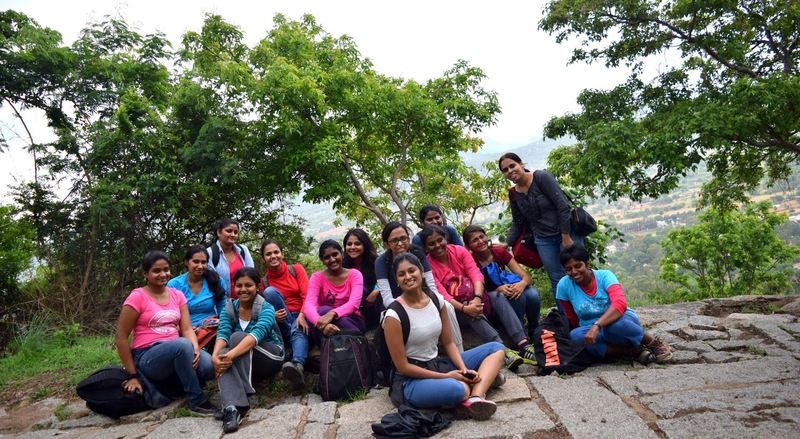 Special thanks to RajaLaxmi and Raksha for organizing this trek. And all the fabulous ladies for joining this trek and making it memorable. Cheers! !